The five month Intermediate iii of Major 3 of Primary III uptrend continued its relentless ways this week, carrying the SPX to all time new highs. For the week the SPX/DOW were +2.20%, and the NDX/NAZ were +2.95%. Asian markets gained 1.1%, European markets soared 4.3%, and the DJ World index gained 2.5%. Economic reports, however, were mostly to the downside for the first time in many weeks. On the uptick: business inventories, the M1 multiplier, plus both weekly jobless claims and the budget deficit improved. On the downtick: wholesale inventories, export/import prices, retail sales, the PPI, consumer sentiment and the WLEI declined. Next week we get a look at Industrial production, Housing, the NY/Philly FED, the CPI and the FED’s Beige book. The March 2009 bull market passed a new milestone this week carrying the SPX to all time new highs. Four years ago the SPX was trading at a 14 year low when it hit 667. Since that low it has gained 139%! We continue to track this bull market as Cycle wave  of Super Cycle wave 3. Two of the five Primary waves that create this kind of bull market concluded in 2011 at SPX 1371 and 1075 respectively. Primary wave III has been unfolding since then. Within Primary wave I five Major waves unfolded with a subdividing Major wave 1. Primary wave III is also unfolding in five Major waves, but both Major 1 and Major 3 are subdividing into five Intermediate waves. Major waves 1 and 2 completed in mid-2012 at SPX 1422 and 1267 respectively. Major wave 3 has been underway since that low. Intermediate waves i and ii completed in late-2012 at 1475 and 1343 respectively. Intermediate wave iii, our current uptrend, has been underway since that low. When this uptrend does conclude we expect an Intermediate wave iv downtrend, then an Intermediate wave v uptrend to conclude Major wave 3. Then after a Major wave 4 correction, a Major wave 5 uptrend to complete Primary wave III. Finally, after a Primary IV correction, a Primary V uptrend to complete the bull market. Currently we are expecting the bull market to end in late-winter early-spring 2014, between SPX 1650 and 1779. 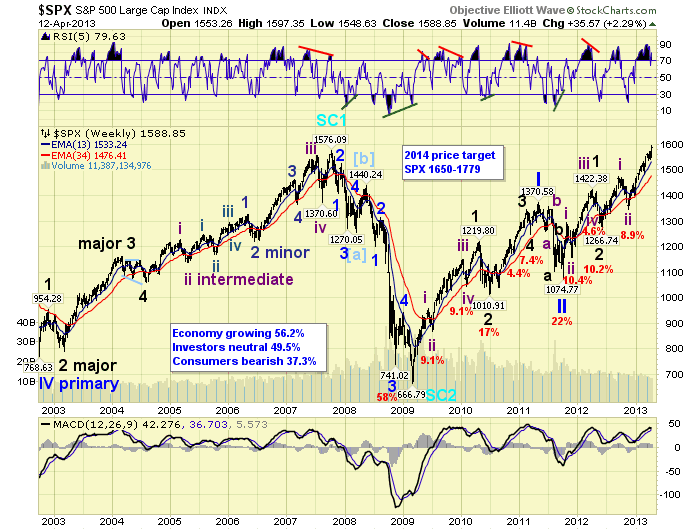 Instead of entering an Intermediate wave iv correction from the SPX 1574 high. The market took off on Monday and did not look back until hitting SPX 1597 on Thursday. This last rally was one of the strongest rallies of this entire uptrend. When the DOW quickly made a new uptrend high on Tuesday, we anticipated the uptrend was extending yet again. We posted a couple of potential counts on the SPX/DOW daily charts, while we awaited some additional market activity and an opportunity to review. These were posted on Wednesday. After careful consideration we continue to favor the DOW count. When in doubt defer to the bellwether DOW. Intermediate wave iii divided into five Minor waves. 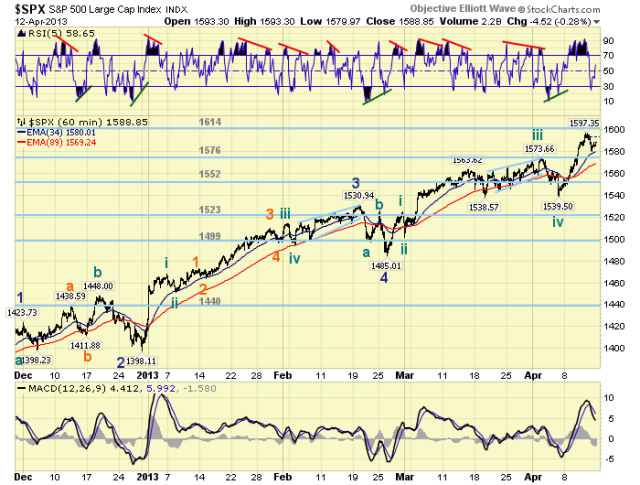 Minor waves 1 – 4 remain as previously posted SPX: 1424-1398-1531-1485, with Minor 5 underway from that low. Within Minor wave 5 we have made one change. 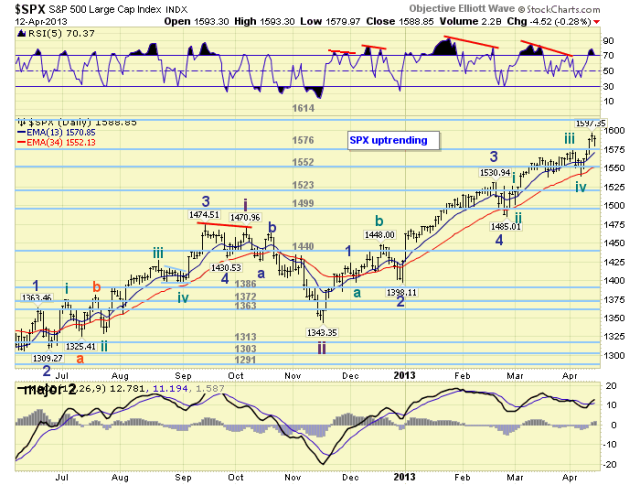 Minute wave i and ii remain at SPX 1524 and 1501. But Minute waves iii and iv have been upgraded to SPX 1574 and 1540. This fits well with the DOW’s Minor 5 advance, which is the same count. Therefore, the uptrend is still in Minute wave v of Minor wave 5. Short/medium term support remains at the 1576 and 1552 pivots, with resistance at the 1614 and 1628 pivots. Short term momentum rose from oversold on Friday to just past neutral. The short term OEW charts remain positive with the reversal level now at SPX 1575. When we review the entire uptrend we observe: Minor 1 was 81 pts., Minor 3 was 133 pts. and Minor 5 is 112 pts. thus far. Since Minor 5 has already exceeded the length of Minor 1, it can equal Minor 3 at SPX 1618. Then we would have both Minor waves 3 and 5 1.618 times Minor 1. Within Minor 5 we observe: Minute i was 40 points, Minute iii was 73 pts. and Minute v is 57 pts. thus far. Again since Minute v has already exceeded Minute i, it can equal Minute iii at SPX 1613. Then we would have both Minute waves iii and v 1.618 times Minute i. Lots of symmetry between SPX 1613 and 1618. Which also straddles the OEW 1614 pivot. This Fibonacci cluster looks like a good place to look, yet again, for an uptrend top. Best to your trading! The Asian markets were mostly higher on the week for a net gain of 1.1%. Australia, China, Hong Kong, India and S. Korea remain in downtrends. The European markets were all higher on the week for a net gain of 4.3%. England, France, Germany, Greece, Italy, Spain and the STOX 50 are all in downtrends. The Commodity equity group were all higher on the week for a net gain of 0.7%. All three; Brazil, Canada and Russia remain in downtrends. Seventy-five percent of the world’s indices are in confirmed downtrends while the US is making all time highs. Quite unusual! The DJ World index is uptrending and gained 2.5% on the week. Bond prices are uptrending, yields downtrending, and bonds lost 0.2% on the week. Crude is still in a downtrend and lost 1.9% on the week. Gold’s downtrend continues, as it broke to two year lows, losing 5.0% on the week. The USD appears to be in a downtrend and lost 0.5% on the week. Monday kicks off the economic week with the NY FED at 8:30 and NAHB housing at 10:00. Tuesday: the CPI, Housing starts, Building permits and Industrial production. Wednesday: the FED’s beige book. Thursday: weekly Jobless claims, the Philly FED and Leading indicators. Friday: Options expiration. The FED is also busy this week. Tuesday: Counsel Alvarez gives TBTF congressional testimony. Wednesday: FED governor Stein speaks at the IMF. Thursday: FED governor Raskin speaks at a conference in NYC. Friday: FED governor Stein speaks at the N. Carolina FED. Best to your weekend and week! Copyright © 2013 Tony Caldaro - All Rights Reserved Disclaimer: The above is a matter of opinion provided for general information purposes only and is not intended as investment advice. Information and analysis above are derived from sources and utilising methods believed to be reliable, but we cannot accept responsibility for any losses you may incur as a result of this analysis. Individuals should consult with their personal financial advisors.